Buildings and parking aren’t the only locations that people need to find on your campus. Why then, are they the only items marked on your maps? The technology to create beautiful, interactive maps has been around for a while. Unfortunately, many colleges choose to only include a limited amount of information. Often, it’s not a technological hurdle, but instead a content issue. Let’s solve this by distributing the ability to add items to the map. In this 45 minute session, I will show you how to set up your own platform to collect and maintain user generated map content. It’s a lot easier than you might think. In just the past year, our maps have been extended to include campus artwork, sustainability highlights and thousands of accessibility features. Given the power, what would your users add to the map? Just let me download it already! 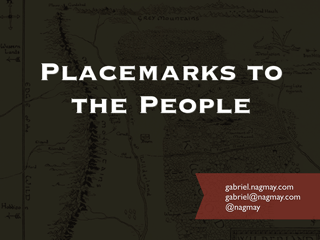 Placemarks to the people is the place to be! Location description: Halfway down the block on the south side.